The two models within the BT Vector “Advanced” A-series of very narrow aisle trucks have an articulated chassis for optimum stability, as well as extremely narrow transfer aisles, providing more warehouse storage space. 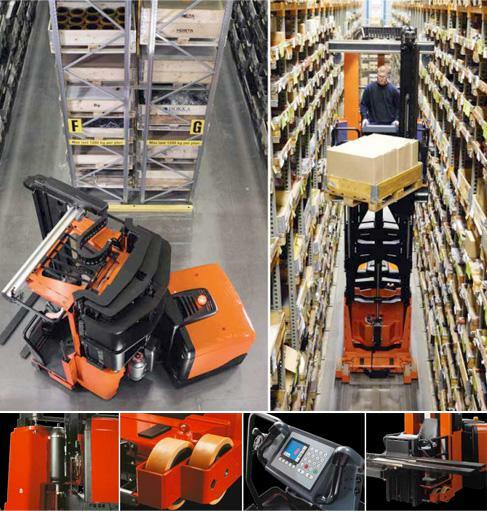 With standard picking heights of up to 14.3 metres, and a maximum load capacity of 1.5 tonnes, our “Advanced” trucks are capable of high-level order picking and full-pallet handling in wire or rail-guided aisles. 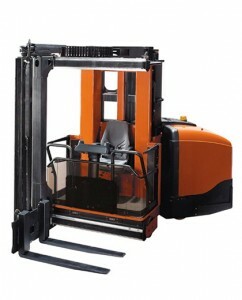 The Advanced BT Vector A-series with 4-wheel design provides great truck stability, as well as high lift capacities and a smooth ride, whilst the articulated steering minimises transfer aisles and creates additional storage space. The A-series trucks include BT Advanced Lifting, which significantly reduces the amount of battery energy required to lift the truck cab and load, allowing two-shift operation on a single charge. With lift heights up to 14.8 metres, these narrow aisle trucks are perfect for order picking and pallet handling in very narrow aisles.